Goodreads says, " In 1950, Ingrid Bergman - already a major star after movies like Casablanca and Joan of Arc - has a baby out of wedlock with her Italian lover, film director Roberto Rossellini. Previously held up as an icon of purity, Bergman's fall shocked her legions of American fans. Growing up in Hollywood, Jessica Malloy watches as her PR executive father helps make Ingrid a star at Selznick Studio. Over years of fleeting interactions with the actress, Jesse comes to idolize Ingrid, who she considered not only the epitome of elegance and integrity, but also the picture-perfect mother, an area where her own difficult mom falls short. In a heated era of McCarthyism and extreme censorship, Ingrid's affair sets off an international scandal that robs seventeen-year-old Jesse of her childhood hero. When the stress placed on Jesse's father begins to reveal hidden truths about the Malloy family, Jesse's eyes are opened to the complex realities of life and love. 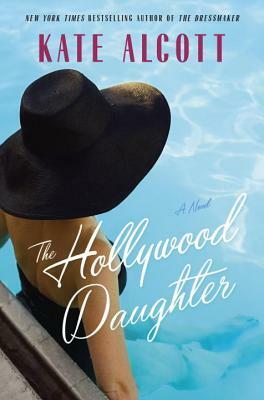 Beautifully written and deeply moving, The Hollywood Daughter is an intimate novel of self-discovery that evokes a Hollywood sparkling with glamour and vivid drama." Jesse Malloy is living a normal life in New York City until one day she is invited to attend the Academy Awards. She hasn't returned to California in years and this unexpected invitation brings back a ton of memories. We flashback to her childhood where her father worked in PR at the famous Selznick Studio and worked with many celebrities, including the famous Ingrid Bergman. Jesse worships Ingrid not only because she is an incredible actress, but because she sees how much Ingrid loves her daughter. You see, Jesse's relationship with her mother falls short tremendously. Although her dad is really warm, her mother is the opposite and is pre-occupied with the Catholic Church and all of its rules. As things progress in Hollywood for Ingrid, they also progress for Jesse's family. But Ingrid, despite her pure reputation, has an affair and a child out of wedlock, which throws everyone for a loop. Plus, as Jesse gets older she starts to see things much more clearly with regards to the truth about her own family. Kate Alcott's The Hollywood Daughter is an enjoyable read that fans of Old Hollywood as well as classic movies with savor. I was immediately interested in the character of Jesse in The Hollywood Daughter. I thought her upbringing as the daughter of a publicist in Hollywood during the 40s was interesting, especially as we learn more about what Jesse's father had to deal with. (More on that later!) Jesse was able to rub shoulders with other Hollywood children and that is how she has come to idolize Ingrid Bergman. Ingrid Bergman's daughter attends Jesse's school and all is well and good until Jesse's religious mother, worried about Hollywood's influence on her daughter, has her transfer to St. Ann's. Jesse thinks things are pretty much over for her, until she befriends a charismatic young girl and Ingrid actually comes to film The Bells of St. Mary there. I liked how the author not only made this story a coming-of-age tale for Jesse, but also incorporated Ingrid's life into the storyline as well. The setting of 1940-1950s Hollywood was captivating in The Hollywood Daughter. I was intrigued by glamour of Hollywood versus the censorship that was happening during this time period. I had no idea about the Catholic Church's influence on movies and found all of this to be fascinating. I am also greatly intrigued by Ingrid Bergman's life and was happy to learn more about her in The Hollywood Daughter. I knew about her affair with Roberto Rossellini, but I didn't know how scandalous it ended up being for her, especially for the time period. One thing is for sure: Alcott really knows her classic movies. It's obvious after reading this novel how well researched this book is and how familiar she is with Ingrid's life. While all of this turmoil is happening for Ingrid, it's juxtaposed by Jesse's coming-of-age story, which is the best aspect of this novel. So, while I didn't find The Hollywood Daughter to be as compelling of a tale as Alcott's A Touch of Stardust, I still enjoyed this foray into Old Hollywood as well as a fascinating time period in history. Great review! I love old movies and I know a little about Ingrid Bergman already but I think this book sounds fascinating. Thanks for putting it on my radar. I love the old Hollywood era as well. The 40s and the 50s brought us some really cooler than cool actors with lots of swag. :D I had no idea about the Catholic Church's influence in the movie scene back in the day as well. Makes me want to read this one now as well! I agree. SO much swag! :) It was really interesting in that aspect. Definitely check out Alcott's A Touch of Stardust as well...I liked that one a bit more. Thanks for visiting, Joy! Oh, I love when historical fiction actually digs into the lives of real recognizable people, and learning more about Ingrid Bergman's life sounds fascinating! The coming-of-age story sounds really great as well. Thanks for sharing your thoughts on this one, Christina! Me too! I didn't know too much about Bergman going into this, but have always been a fan of her. She definitely led an interesting life! Thanks for visiting, Becky!